“Yes, but the winds come up in the afternoon on the ocean,” I said in response to a suggestion we take an afternoon cruise to the Low Isles. “But you have to see the sunset,” my cousin said. To be fair, the winds were stirring the waters morning and afternoon, so visibility would be reduced and the quality of the snorkelling on the reef would be compromised. We booked an afternoon cruise with Sailaway out of Port Douglas marina. It was li ke driving on a bumpy road all the way out to the mooring just off Heritage Island. The captain worked hard. The coral cay was below us and we were keen to explore. Geared up, we sank into the blue water with eyes wide open. We’d been told about the reef sharks and we wanted to see one. Token efforts were made to stay with the main group because it was too much fun exploring underwater alone. As predicted, visibility was limited to perhaps 4metres. From the surface, the coral was pale and the colours watery. But when I dove down and hung suspended within a metre or so, the colours of the coral and there fish were vibrant. Amazing. And to think government policies treat such beauty with disregard. It saddened me as I marvelled at the beauty a few metres below the surface. Just as I turned to face a large school of fish I thought to swim into it. Two slow kicks with my fins and then I stopped. Equally unhurried was a reef shark. Perhaps a metre and a half…a metre and a half from my goggles. Its languid movements conveyed a sense of calm and confident control of its domain. The shark had 100% of my attention. It paid me no heed at all. Zero attention. I caught up with my friend to tell my story. Then came a call to finish up and return to shore. As we started to swim away, there was a stingray snuggled into the sand at the bottom. As we approached, it darted away. 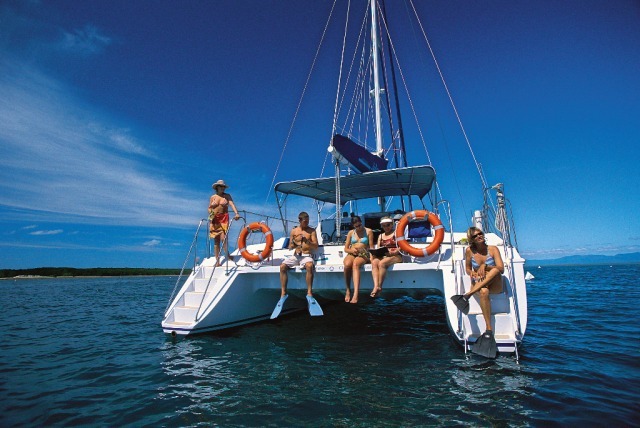 We splashed in the shallow water and then boarded the small, glass-bottomed run-about that took us back to the yacht where wine and wonderful food were laid out. We’d had a good swim and snorkel didn’t know the best was yet to come. On the sail home, we sat up near the skipper to watch him steer us up and over the swell. As on the outward journey, he was working hard and having fun. We rode the swell up and down and sometimes through it – to our drenched delight. 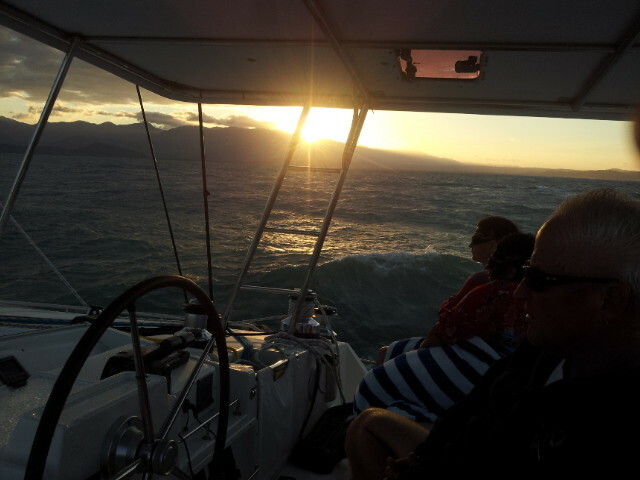 As we bounced and rolled and splashed our way back to Port Douglas, the sun was setting in front of us. With the swell near shore reduced and the sun below the ridge, the mood changed. Suddenly calm. It was nature’s closing time and the afternoon felt complete. With weary bodies, joyous spirits and full smiles, we said our thank you and wandered along the wharf for one last drink before heading home. Yet another full and fun day in Port Douglas! Another glorious day in Port Douglas. But today we were heading north. After a quick stop at Mossman north of PD for some supplies, we travelled slowly, relishing the morning air and feeling the high peaks of the Atherton Tableland that followed us on our left. Breakfast at Newell Beach. We weren’t in a hurry. Hot coffee, fresh fruit, a pastry…or two. 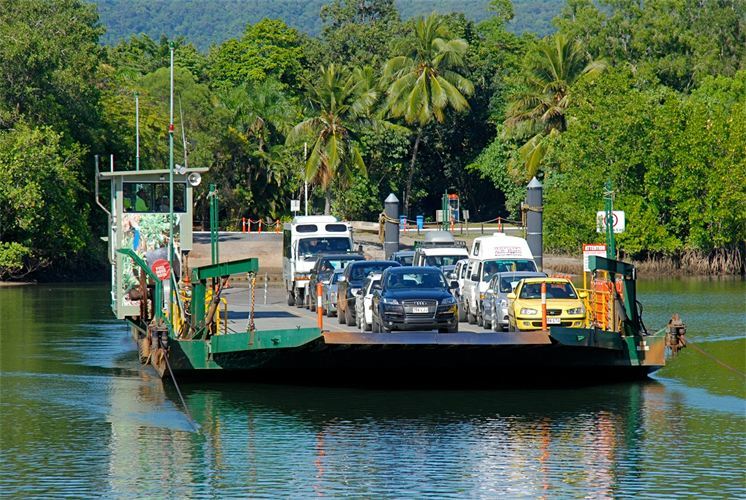 We strolled it off before getting back in the car for our drive to Daintree Village. We stood looking up and down the Daintree River wondering quietly to ourselves and then later in conversation about the crocodiles that might have been in the river. One more coffee for the road. Then to the punt across the river. It was like traveling back in time. We remembered punts from our childhoods in NSW and Qld. This ancient transport took us to ancient forests. Indeed we had been transported 300 metres across a river and thousands of years into the past. Cape Tribulation Road took us slowly up to Mt Alexandra Lookout where we waited until there was almost no one and enjoyed the views down across the plain to where the Daintree River met the sea. Before we left the carpark, we put the roof down on the Mercedes SLK 350, generously loaned to us by my cousin back in Port Douglas. The lookouts and beaches were spectacular, but the real beauty was above. We stopped and put the seats way back so we could just stare in wonder and the lush and vibrant canopy overhead. We could almost touch the roof of the forest. We agreed that we’d make a return visit to explore the forest floor. On to Thornton’s Beach. Well…after an ice-cream at the Daintree Ice Cream Company, it was on to Thornton’s Beach for lunch. Our picnic lunch was complete with a yummy Pinot Noir. The beach stretched north and south from where we sat. Low tide gave us plenty to explore in both directions before a short snooze on the sand. A spicy meal awaited us back in PD. 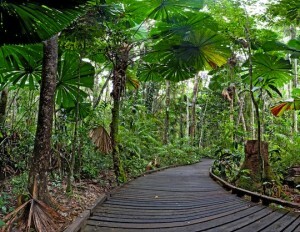 So we decided to leave Cape Trib for our next visit. We packed up and dawdled back in our sports car to the punt. Yep, another glorious day in PD.